Debt concerns loom – what hope for a progressive approach? There was general optimism of near-term growth mixed with concerns about medium-term challenges, which the Fund’s Chief Economist described as “sobering.” The Fund’s World Economic Outlook (WEO) report released during the meetings predicted 3.9 per cent global growth this year and next – the highest growth rates since 2011. It noted however that “risks beyond the next several quarters clearly lean to the downside”, with “possibly sharp tightening of financial conditions, waning popular support for global economic integration, growing trade tensions and risks of a shift toward protectionist policies, and geopolitical strains.” Echoing the WEO’s concerns and the G24 communiqué, the World Bank’s Development Committee communiqué stressed challenges posed by “persistent global headwinds and structural changes to the global economy” (see Dispatch G24 and Development Committee communiqué analysis). Civil society organisations (CSOs) feared that while the FM urged “countries to implement policies to support medium-term growth by promoting human and physical capital”, the Bank and Fund will continue to promote regressive tax policies, privatisation of essential services and the dismantling of labour rights in the name of reducing debt, as was the case in Tunisia and Brazil, among others. The working draft of the 2019 World Development Report on the ‘World of Work’ clearly illustrated the grounds for pessimism with a return to a discredited focus on deregulation and an attack on unions and minimum wages. To some degree echoing the G24 communiqué, CSOs continued to call for a focus on progressive policies to enhance domestic resource mobilisation and the development of a global tax regime anchored on a human rights-based approach and in line with the G77’s demand for a UN tax body. General Capital Increase – a better or just a bigger Bank? Referencing the changes in shareholding structure and hinting at China’s increased weight, Mnuchin underlined that the US expects “countries benefiting most from the new shareholding arrangement to take on a greater share of the burden to help the poorest.” The Development Committee also called for a review of salaries. 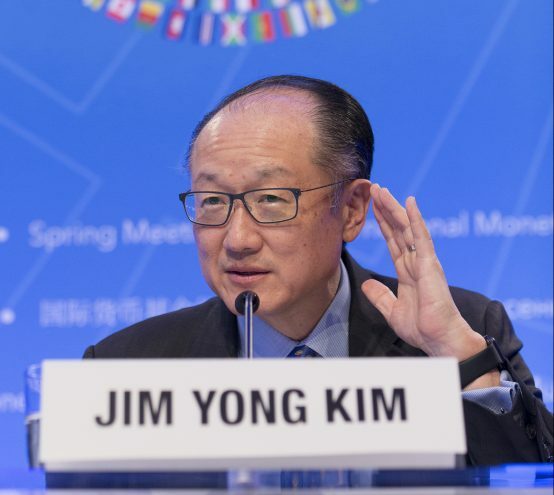 World Bank President Jim Yong Kim, as quoted by Reuters, acknowledged that World Bank compensation will be held to “a little below average” for the financial sector. While the Treasury Secretary’s statement explicitly supported the IFC’s proposals to systematically vet operations to “assess their … development impact while avoiding crowding out private investors” through its new development impact assessment framework (AIMM, see Observer Spring 2018), no mention of this was made by the Development Committee. In contrast with the talk of a “better Bank” resulting from the proposed capital increase, a group of European CSOs stressed that their support for the proposed increase remains contingent on significant changes, namely: a radical change in its governance structure to give, at the very least, equal voting power to client countries; the development of a human rights policy; more explicit focus on additionality and transformational impact; and significant changes to staff incentives – with a focus on the achievement of human rights-based development outcomes. These CSOs expressed concern about the combination of increased capital, a focus on more challenging environments with potentially fewer staff, and a drive for a ‘self-sustaining’ Bank – which CSOs fear will further disincentive the Bank from taking financial risks in the name of transformational impact. In line with the Forward Look, the capital increase agreement reinforces the push for greater Bank and IFC focus on low-income countries and fragile and conflict-affected states (FCS). It is barely an exaggeration to say that one could not avoid discussions about fragility at the meetings, as in nearly every official ‘flagship’ event references were made to the need to work effectively in fragile states. The IMF was not exempt from this push with extensive emphasis on the need to improve its performance in FCS after the release of the Fund’s Independent Evaluation Office April report on the matter, which highlighted that “initiatives [on FCS] have not been sufficiently bold or adequately sustained, leaving questions about the credibility of the Fund’s commitment in this area” (see Observer Spring 2018). Celebrating the Universal Declaration of Human Rights: what human rights impacts? The Office of the UN High Commissioner for Human Rights and the World Bank also hosted a session to celebrate the 70th anniversary of the Universal Declaration of Human Rights (UDHR), at which CSO participants were left shaking their heads in near disbelief. They were left to ponder the implications of the fact that, 20 years after the Bank’s last session to celebrate the UDHR, all the Bank could muster were limited and superficial references to a very small trust fund used to support small-scale initiatives and a focus on governance. Rather than celebrating the anniversary by announcing a long-demanded human rights policy, there was absolutely no indication the Bank accepts that its large lending and technical assistance portfolios have significant human rights impacts that should be explicitly evaluated and addressed. Despite the initial hopes of those present, the session very clearly confirmed the accuracy of the UN Special Rapporteur on Extreme Poverty’s 2015 assessment that the World Bank remains “a human rights free zone”. The human capital project: support for improved public service delivery or backdoor to privatisation and deregulation? President Kim’s human capital project seems alive and well with references to it made by the Development Committee and Forward Look. While the approach’s proposed focus on ‘investment in people’ and in particular health and education seems hardly radical, many were left to wonder about its details, with fears that the Bank will use the human capital focus to push for increased private sector involvement in the provision of essential public services such as health and education (see Observer Spring 2018). At a more elemental level, questions remain as to how the human capital project will address structural barriers to addressing global inequality, such as the skewed trade regimes, unfair global tax arrangements and the Bank’s continued support of failed export-led and extractivist development models. Last July, the IMF’s Independent Evaluation Office published a critical report entitled The IMF and Social Protection, which exposed that the IMF’s targeting approach to social protection did not “mesh well” with the universal human-rights based approach. In response, the IMF board agreed in July to establish a strategic framework by February 2019 to guide future Fund work on social protection, through a board-approved ‘institutional view’. During the meetings, the IMF hosted a consultation panel with civil society in which they set out a time-frame and strategy for developing the institutional view. During a seperate CSO panel event and discussions with staff, CSOs pushed the IMF to adopt a human-rights based and universal approach to social protection, as opposed to a targeted approach, and spoke of the concern around the impact of austerity on corroding vital social protection (see Observer Spring 2018). As expected, after the significant announcements during last year’s annual meetings and with senior Bank staff focused on capital increase negotiations, no new significant climate announcements were made during the spring meetings. During a CSPF session on aligning multilateral development banks with the Paris Agreement, the Bank’s Climate Director, John Roome, indicated that the Bank will announce a new set of post-2020 climate targets at the UN Framework Convention on Climate Change (UNFCCC) Conference of Parties (COP) 24 in Poland later this year. The Bank is also integrating shadow carbon pricing into project analysis, and working with UNFCCC to validate its methodology on greenhouse gas emissions tracking, which it will publish later this year. Despite December’s announcement that the Bank will phase out funding for ‘upstream’ oil and gas after 2019, civil society has pointed out that the Bank has much to do to fully decarbonise its lending activities (see Observer Spring 2018). Finally, the recently established (permanent) Civil Society Policy Forum Working Group (WG) met for the first time with CSO representatives during the meetings (see Observer Winter 2017-2018). The discussion, which was not particularly well-attended, focused on the introductions of the WG members and exchanges on its focus. Members of the WG lamented the lack of resources provided (with funds to attend spring and annual meetings not provided to the group) and noted that, to date, they had principally contributed to the selection of CSPF events, although processes around this need improvement and clarification. The bulk of the discussion focused on better defining the participants’ perception of its role – whether it should be principally administrative or more explicitly geared toward advocating for more substantive interaction between civil society and Bank and Fund staff. The WG circulated a paper questionnaire to gather information on the community’s expectations.